Monday afternoons after school were always a drag for me growing up. Born and raised in a Roman Catholic household, my parents enrolled and demanded I attend weekly “religious education” classes every Monday from 3:30 to 4:30 at the church that was just a few blocks away from my elementary school. While I was still a bit too young to have the defined view on organized religion that I have today (for the sake of not dwelling too much on an opinion I hold that has nothing to do with Spider-Man comic books, let’s just say religion and I don’t get along), I always felt that these weekly classes were a waste of time. A bunch of kids that I’ve already spent the bulk of my day with at public school would sit around on the floor and be lectured by someone about peace and love and most importantly, make sure you go to church every week (What if I’m sick? What if another family commitment keeps me from attending? Then you FIND a way, I was told). My only salvation was that the church was directly across the street from “Jack’s,” the mythical newsstand/smoke shop that also doubled as the birthplace of my love of comic books thanks to the colorful offerings found on the spinner racks inside the store. Every week before class, my mom would give me a $1. A paltry bribe for sure, but with this $1 I could go to Jack’s before class started and grab myself a snack or a soda to tide me over. Because I’m such a contrarian, I often used that $1 to grab a comic book, especially if it featured Spider-Man on the cover. 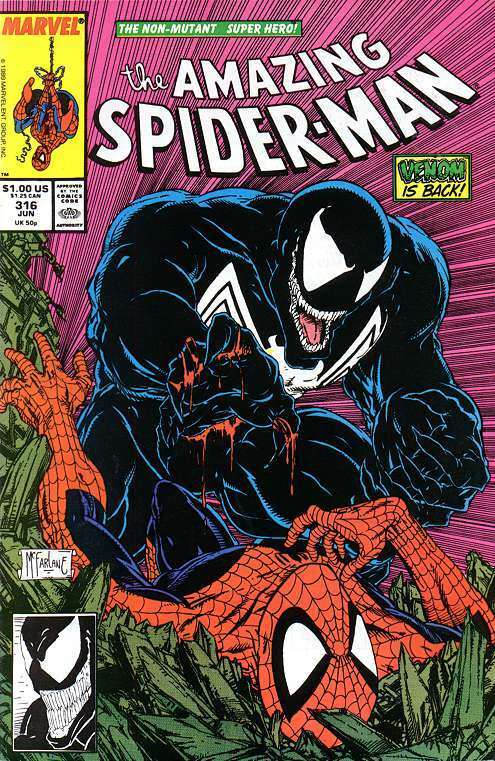 There was something both and engrossing and intimidating about Todd McFarlane’s illustration on the cover of Amazing Spider-Man #316 the first time I ever saw it, which of course would be during one of those Monday pit stops. 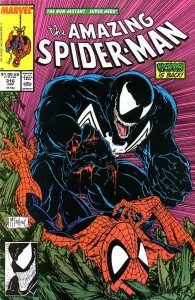 I previously listed this issue as one of my top 10 favorite covers, and while I think nearly everyone would agree that it’s one of Marvel’s definitive Venom images – him kneeling triumphantly over Spider-Man’s fallen body, his sharps claws tearing at the red and blue costume (I actually initially thought the red on his claws was Spider-Man’s blood until I realized it was his ripped outfit) – I would wager my childhood connection to this comic is a major reason why I hold this art in such high regard. After setting my eyes upon this comic, I was both desperate to own it and see for myself if this horrifically frightening villain actually succeeded in dominating Spider-Man that way it was depicted on the cover. But there was also a part of me that purchased this comic with my hands over my eyes like I was watching a Friday the 13th movie and we had just gotten to the part where Jason was holding a machete and was sneaking up behind the half-naked teenagers. I wanted to see what happened next, but, oh, how I also didn’t want to see the blood and severed heads. Because of my manic state-of-mind, I didn’t even consider if it was appropriate to spend my $1 on this comic minutes before I was ready to walk inside a church to hear about Jesus, the 10 commandments, and all of that other stuff we talked about every week in class. I grabbed it, and then immediately felt insecure about it. What would happen if the teacher saw this demonic, sharp-toothed character on the front of my book? What would she think if she saw the red on his claws (if I mistakenly thought it was blood, she would have certainly thought the same, right)? Would she confiscate the comic book from me? Even worse, would she tell my mother what I was carrying around? The sudden burst of shame I felt for ASM #316 led to me haphazardly shoving the comic in my backpack. Amid my marble notebooks and math textbook, the comic became wrinkled and crunched. When I got home that night to read my newest purchase, the comic was already on the verge of falling apart. In the past, I’ve talked about my collection’s “survivors” – those comics I first purchased as a kid that actually stood the test of time and still exist in bags and boards in my archives today. My first copy of ASM #316 was NOT one of those survivors. Years later, I would acquire a copy of this issue via the infamous “big box of comics” I’ve mentioned many times in the past. When I held the comic in my hands again, I felt shame for my 8-year-old self in not being able to hold to this comic the first time around. Why did I panic and think a religious education teacher would seriously care about me bringing this comic into class? In retrospect, maybe my 8-year-old instincts weren’t that far off. 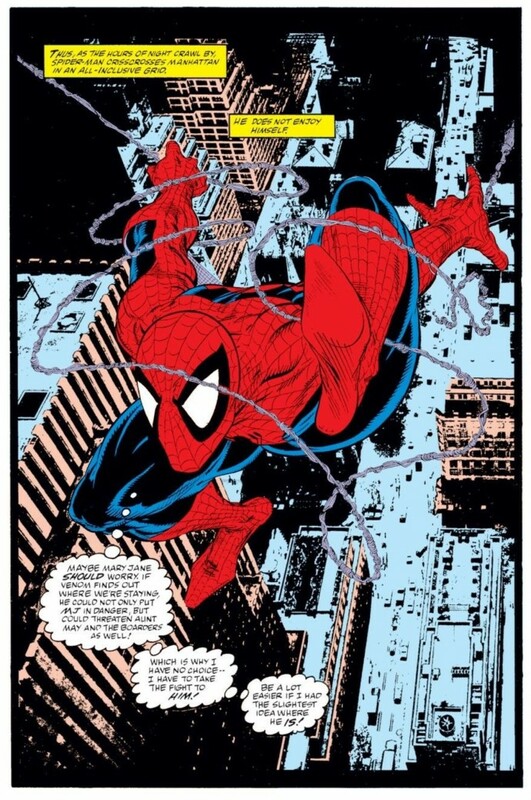 On the interior, ASM #316 is one of the edgiest Spider-Man comics from that era. 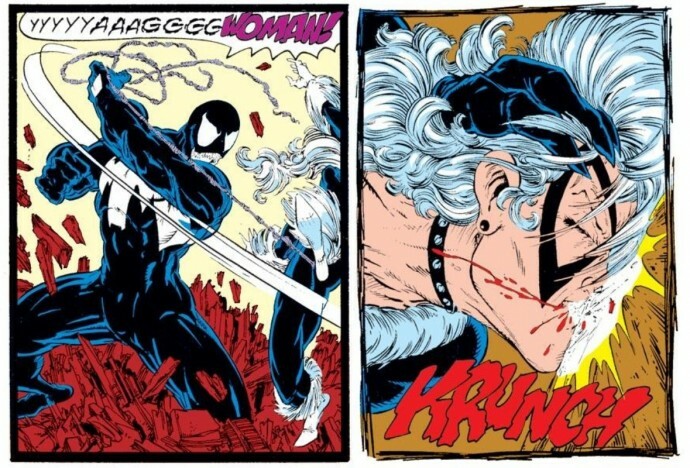 The scene involving Venom brutally beating Black Cat certainly stands out in my mind as being something that’s very uncomfortable to read about. While I realize Black Cat is far from defenseless, seeing Spider-Man’s ex-girlfriend (who was always portrayed by every creator as being quite stunningly beautiful) get her face smashed into a wall is certainly tap-dancing on the line of decency. Sure, Venom is very clearly defined as a VILLAIN, a bad guy who does EVIL things, but to so graphically injure a woman? 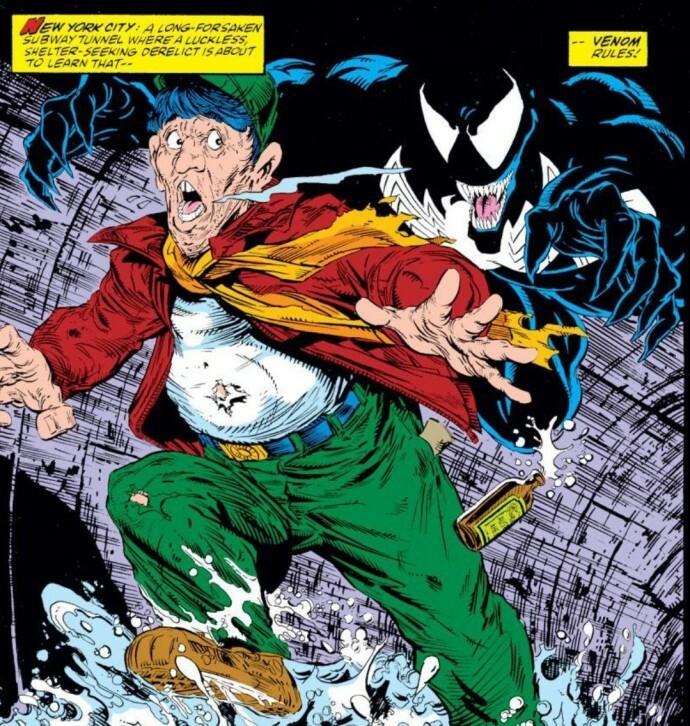 I have to imagine any adult I knew – not just a religious education teacher – would probably be disappointed to see my 8-year-old self reading a comic with such this Black Cat/Venom scene. The end of ASM #316 is not as uncomfortable, but it is rather crude. During his fight with Venom, Spider-Man gets a vat of blood and guts (literally, it’s a vat of offal) dumped on him. It’s far from the WORSE thing that’s ever happened to Spider-Man, but it’s a pretty gross visual all the same. Did David Michelinie and Todd McFarlane really need to resort to offal in a Spider-Man story? 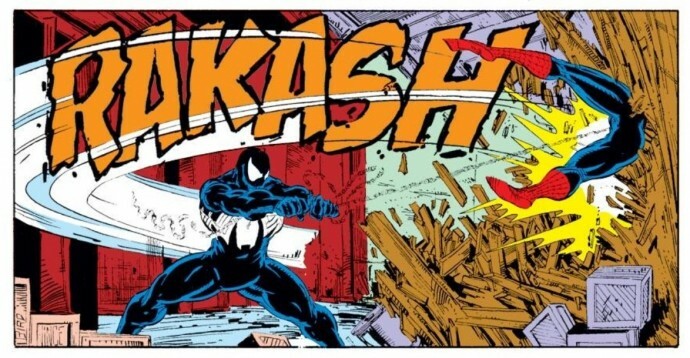 Of course, in retrospect, it was these scenes – as uncomfortable and crude as they might be – that helped define Venom as such a special attraction during his initial run in comics. When Venom showed up in a story, the unexpected happened, whether it was the villain kissing the forehead of a security guard he just killed, or a vat of guts getting dumped on the head of the comic’s hero. “The Return of Venom” arc really captured the chaotic nature of Venom, moreso than his portrayal in his first appearance in ASM #300. By hook or by crook, these stories grabbed me and made me a fun of Venom, Spider-Man and the genre. These comics were something I became very passionate about, and who can argue with a kid or a teenager having a passion for something, even if it’s just a superhero soap opera? Though I doubt I could get my religious education teacher to agree with me all these years later. This is part two of the “Return of Venom” storyline. My thoughts on part three (ASM #317) will run next week. Hey! Long time no speak. Glad you’re still checking in on the blog! This is the first issue I believe that revealed the address to the Parker house. After many years i picked u this issue along with Spidy 300, Im not a spiderman fan at all i just enjoy the villians, I felt sorry for youre hardship as you had to attend school that extra hour thats painful thinking about it, but atleaset you could think about the comic you had bought at Jacks! I love how comics bring back good memories the art and the story. Great Post i hope to see more!